Our dear friend S250 dropped by our forums early this morning to give us a fair warning – knock-off toys are coming! 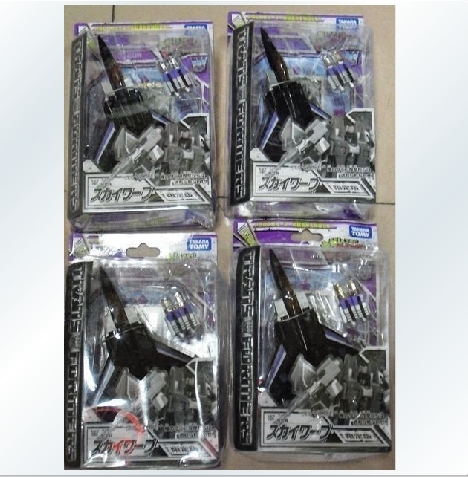 And they’re coming in the form of TakaraTomy Henkei Skywarp action figures! As you can see in our attached image, it’s tough at first glance to determine the difference between an actual figure and the knock-off figure. Until a clear image or comparison image shows up, it’s buyer beware time. Apparently these figures are hitting China en-masse, and will most likely be found on your favorite auction sites within this next week. Depending on your stance on the whole knock-off toy thing, this is either great news or this is really souring news. Either way, stick to TFW2005 for more information and how to distinguish your real Skywarp from your fake Skywarp! Hey guys, finally got my henkei Skywarp today and as I suspected this is the "high" quality KO that was reported earlier. How did I know its a KO?? QUALITY!!! this figure totally feels like a KO and I know Taktomy had QC issue with this run of toys such as the TC not holding the missles in place. But this toy I got feels like a KO and there are many sights of it being KO. Unfortunately I don't have a camera with me right now to snap some pics but I will describe what I notice below. Packaging – decent but not up to par of normal henkei packaging, the plastic feels cheaper and the top plastic section should rest below the word destron but my came with the top plastic cover tape above the word destron. The instructions was not pack in a normal plastic sleeve and the print quality is not as nice. -paint app was decent but there where some area of overspray like on missile and on one of my decepticon symbol, it had some paint bleeding. -joints are very loose, the arms flop around and when I transformed him at first, one of the leg popped off the ball joint. One of my wing is loose and feels like it can snap off with too much pressure on it when I rotate it. The back fins are toooo tight and hard to flip up. -missles fall out of the arms easily, similar to the henkei TC and this is due to the arms having gaps from the construction. -and overall the plastic does not feel as strong and there are parts of the plastic which is kind of rough looking and not smooth. -but if you will only use it for display, this piece will do just fine in your collection if you don't want to spend over $100 for a Henkei Skywarp now on the after market. I can probably put some nail polish to make the missle fit in the arms but overall I'm happy with the buy as I was pretty sure I was buying a KO (paid $50). But if you get tricked and paid normal Henkei skywarp prices on ebay and get a KO one then I would be pretty choked. So in conclusion, worth the price if you know its KO and paying KO prices, not worth if if you get tricked by a shady seller. I hope this review helps with your decision if you decide to buy one. I hope they release TC soon as I would buy and add that to my collection as well. I have the originals MISB but this KO makes a good stand in on my shelf. BBTS usually wouldn't stock bootlegs like these; HasTak's legal team would be all over them. Looks like the KO Henkei Skywarp is showing up on ebay. I just bought this auction. Will post later on quality once I have the item in hand. For $50, I hope it is a good quality KO. How do you know its a KO for sure? The basic gist I got from the pics & translating this page with Google Chrome is that there are some obvious paint differences and many minor molding differences, like alignment problems, small gaps and loose joints (not positive on that last one). Seems pretty cool. I hope they KO some of the more rare Henkei. yes please, i keep trying to bid on a henkei rodimus and i can never win one for more /less than 100.00. i mean i only want a toy to use with my add on kit. as long as it a high quality ko. im fine with it. i know theres people who only buy real. then theres people who buy both real and fake, like me. so i guess both sides is happy. buy if you like, dont buy if you dont like. It's really sad for the state of the hobby that we get a post about illegal knock-offs and most of the posts are about how cool it is, and hoping they KO even more rare Henkei…!?!?! how about a ko henkei rodimus prime? i would buy a ko instead of paying 100.00. We need a comparison shot. I wonder why they never done a KO out of rodimus & hound? Same here. I'd be interested to see what's their selection process for picking which mold to knock off. KO companies aren't that bright are they? It seems to be some untapped potential in the classic seekers mold. Why give us what we have or can get for nearly the sme cost. When you could do Sunstorm, Thundercracker, the Generic purple seekers or the cartoon Rainmaker variations of the mold. And even a Wildrider colored Hot Rod or a Breakdown colored Sideswipe, etc. Those ideas would get my money. Actually, they don't really have to put out Rainmaker Seekers when there's demand for Skywarp and Thundercracker. Someone released KO versions of Thundercracker and Skywarp several months back, along with KO versions of Classics Voyager Optimus, Nemesis and Ultra Magnus. No idea if these bootlegged Henkei are from the same manufacturer though. I hate KOs. Everytime I buy a G1 toy I always wonder in the back of my mind if it's legit or just another cheap imitation. Now you'll have to wonder when you buy a loose Skywarp. You can solve this problem by…avoiding G1 toys altogether.